Raw. Vegan. Not Gross. is the debut cookbook from YouTube's Tastemade star Laura Miller. A soon to be modern classic, Raw. Vegan. Not Gross. will engage your taste buds with strengthening breakfasts (avocado grapefruit bowls; ginger maple granola), easy weeknight dinners (golden gazpacho; sweet potato curry), crowd-pleasing party food (mango and coconut jicama tacos; spicy mango chile wraps), irresistible drinks & desserts (lavender cheesecake; chile truffles), and many more nutritious, satisfying dishes that are as beautiful and fun to make as they are healthful. 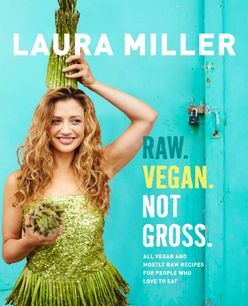 Eschewing a strict or dogmatic approach to raw veganism, Laura's self-deprecating humour, candor about issues of food and body-image, and infectious enthusiasm make her the ideal guide and travel companion for people who want to fall back in love with produce or simply celebrate the joy of real, good food.